Route type: The first part is easy, following the coastline with swimming opportunities, the second part is for more fit cyclists but gives fantastic views. Overview: You start at the monestary of Vatopediou, follow the asphalt road to the village of Vatopedi and then through the olive groves to the coast. You continue through Metamorfosi and on to Nikiti. In Nikiti – enjoy a break in the old part of town, before continuing to the church of Agios Georgios. This is a steep climb. From here you continue to the village of Metangitsi, where you get a beautiful view. The descent is on a paved road back to Metamorfosi and to where you began. 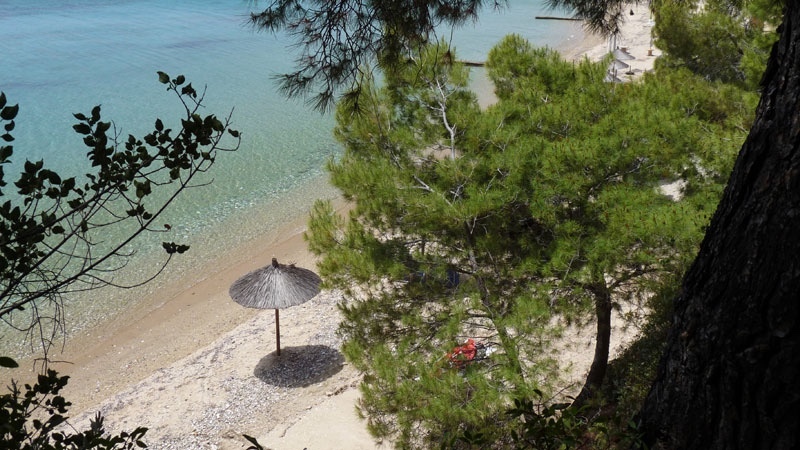 A detailed description with a map is found on page 40 of the Halkidiki Bike Guide, see below.